They say it's not raining enough, and that we need meters. But what Britain really needs is something entirely different: a National Water Grid, to get rainfall from the wetter West to the drier East. And we need to keep control away from Brussels. With a grid, there would be no water shortages. The Major government aborted this idea when it privatised our water industry, dividing England and Wales between 24, mainly French, companies. Water is only in short supply because the companies won't transfer water from where it is available to where it is to be consumed. If oil can be pumped from the middle of the North Sea, refined and piped to every part of the country, we could do something far simpler with water. Workers in the industry could make and lay the pipes, build the aqueducts, build reservoirs and pump water. Water quality is generally excellent. In 2002, the water companies carried out 2.9 million tests on drinking water: 99.87% met all British and EU standards. So we do not need the EU Water Framework Directive. This is the most substantial piece of EU water legislation yet, and it sets up, for the first time, a Common Implementation Strategy (CIS), to "help Member States to implement the Directive". As the EU says, "There remains a need to maintain a common strategic approach and work together throughout the Member States." It is designed to let the EU gain control over the provision of water across the member nations. A huge amount of water is lost due to decaying infrastructure. We lose a quarter of our water supply before it ever reaches our taps. The water companies order spot repairs when they need to replace the pipes. Yorkshire Water no longer provides figures for leaks, claiming they can be "misleading". Thames Water, the biggest water company, has the worst leakage rate, compared with supply, at 33% in 2002/03. In 2003/04, it lost 915 million litres a day, in 2004/05, 884 million. It loses as much through its 100-year-old pipes as Leeds uses in a year. Heavier vehicles cause more damage to pipes, so the EU directive allowing heavier lorries is responsible for much of the leakage. Thames Water aims to ban its eight million users from using hosepipes from 3 April, the first such ban for 15 years. Government schemes, aided and abetted by local authorities such as Kent County Council, for 200,000 new homes in the south-east of England would only worsen matters. At Bittany Hill in North London, a burst water pipe has been pumping water onto the road every day since Christmas. Thames Water says that it is Three Valleys Water's responsibility; Three Valleys says it is Thames Water's responsibility. The government has recently for the first time given a water company, Folkestone and Dover Water, powers to make the installation of water meters compulsory. But metering is expensive, unnecessary and unfair – the poor and sick would bear the brunt. Rationing by price rarely works in the interests of those on lower incomes. Low-income households could face unaffordable bills. Already, the average British water bill is 12% higher this year than last, and one in five households is in debt to their water company. It is not household users that use most water. 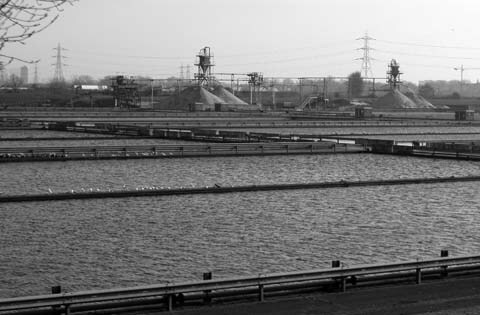 Water treatment works, Walthamstow: London's water is purer than bottled "mineral" water – now the EU is trying to use a directive on quality to take control of it. The Blair government characteristically says that we have to train armed forces to tackle international conflicts over water, for example in the Middle East and between India and China. But Britain should instead be helping to prevent such conflicts by developing peaceful water-treatment technologies for use at home and abroad. The universal provision of adequate water and sanitation is a basic human necessity. More than a billion people lack access to clean water, 2.4 billion lack access to decent sanitation. In the naturally dry areas of the world there is technology that can produce drinking water from sea water. For example, a membrane desalination plant was recently commissioned in Ashkelon, which should be able to produce 15% of Israel's domestic water needs. But this expensive method, which places even more pressure on the environment, should not be necessary in a wet place like Britain. The World Bank estimates the global market for water at $1 trillion annually. Companies are scrambling to seize and profit from publicly run water systems all over the world. Three water companies are among the world's 100 largest corporations – Vivendi Universal, the RWE Group, and Suez. Suez operates in 130 countries and Vivendi in 90. They have a 70% monopoly control over the world's existing water service markets. In 2000, RWE, from Germany, bought Thames Water. Bechtel, the US-based construction giant, and Edison, an Italian water and electricity company, owns the International Water Co. which partners with United Utilities, one of Britain's main private water companies. Since the early 1990s, privatisation of water supply and sanitation has been introduced into a number of countries. Multilateral agencies have been a major driver: they put money into influencing national policies through promotion and advice, but mostly into channelling aid and investment finance to recipient countries. They promote a one-size-fits-all model, irrespective of its adverse effects on sustainable water development. The International Monetary Fund, for example, imposes conditions relating to water privatisation and cost recovery on the poorest and most debt-ridden countries, such as Angola, Honduras, Nicaragua, Niger, Panama, Rwanda, Senegal and Yemen. In December 2001 the inter-governmental International Conference on Freshwater in Bonn declared that "Private sector participation should not be imposed on developing countries as a conditionality for funding." Yet the World Bank's Private Sector Development Strategy of 2002 shows that it will continue forcing countries to privatise through using "policy-based lending" – a euphemism for conditionality. The Blair government is using taxpayers' money to enforce the privatisation of water and sanitation across the world. It has spent millions of pounds of aid money to fund privatisation consultants to advise developing countries to hand management of their water to foreign companies (usually from Britain or France). These consultants include specialists, such as Halcrow, management consultants like Adam Smith International, and big accountancy firms such as PricewaterhouseCoopers. Aid is then provided only if the consultant's privatisation scheme is accepted. The Blair government likes to claim that it has no ideology and simply wants to do "what works". Yet all the evidence shows that these privatisations are a disaster for the working class and only a success for the capitalists. Profits, directors' remuneration and prices have all soared, but capitalists won't invest in extending networks, they 'cherry pick' the most profitable customers and services, they rely on government hand-outs and they avoid markets perceived as risky or unprofitable. As with food and energy, the Blair government is abandoning all responsibility for the basics of civilisation. Public good Community management models, workers' cooperatives, public–public partnerships (PUPs) and more traditional public utilities are all working well across the world, enhancing sustainable development. For instance, Porto Alegre's (the largest city in southern Brazil) municipal water company DMAE achieves a positive developmental impact through democratic management with public participation. They have expanded water supply and sewerage systems in order to increase population coverage, expanded sewage treatment in order to reduce water pollution and public health hazards, and provided better service. The public sector provides more than 90% of domestic water and waste water services worldwide and should continue to do so.